The starter button can only be operated if there is a valid key in the vehicle. 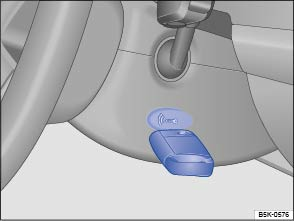 When leaving the vehicle, the electronic steering column lock will be activated when the ignition is switched off and the driver door is opened . Press the starter button once briefly without depressing the brake or clutch pedals . Use the emergency start function when there is no valid vehicle key in the vehicle interior. A corresponding display will appear in the instrument cluster. This could be the case, for example, if the battery in the vehicle key is weak or discharged. Hold the vehicle key to the right of the steering column trim directly after pressing the starter button . The ignition is switched on automatically, and in some cases the engine is started. Press the starter button twice within 3 seconds or once for longer than 1 second . The engine will switch off automatically. If no valid vehicle key is detected in the vehicle interior once the engine has been switched off, the engine can be restarted within approximately 5 seconds. A corresponding message appears in the instrument cluster display. 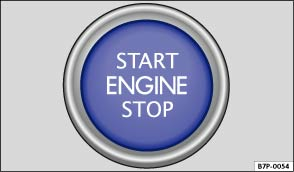 After this time, the engine cannot be re-started without a valid vehicle key in the vehicle interior. Do not depress the brake or clutch pedal when the ignition is switched on as this could cause the engine to start immediately. Improper or unsupervised use of the vehicle key can lead to accidents or injuries. Always take all vehicle keys with you every time you leave the vehicle. Children or third parties could lock the vehicle, start the engine, switch on the ignition or operate electrical equipment such as the electric windows. In vehicles with diesel engines and Keyless Access, the engine start may be delayed if the engine has to be preheated.